Just one year after their incredible performance with Judas Priest in Dublin, the Deth are back and this time, founding member Dave ‘Junior’ Ellefson is with them. Megadeth may not be the most popular of the early eighties thrash metallers but they’re by far Tickets There’s favorites. Dave Mustaine and co’s rapid fire riffs, snarling vocals and mind devouring metal colossus are bench marks few in the metal industry can equal, let along top. 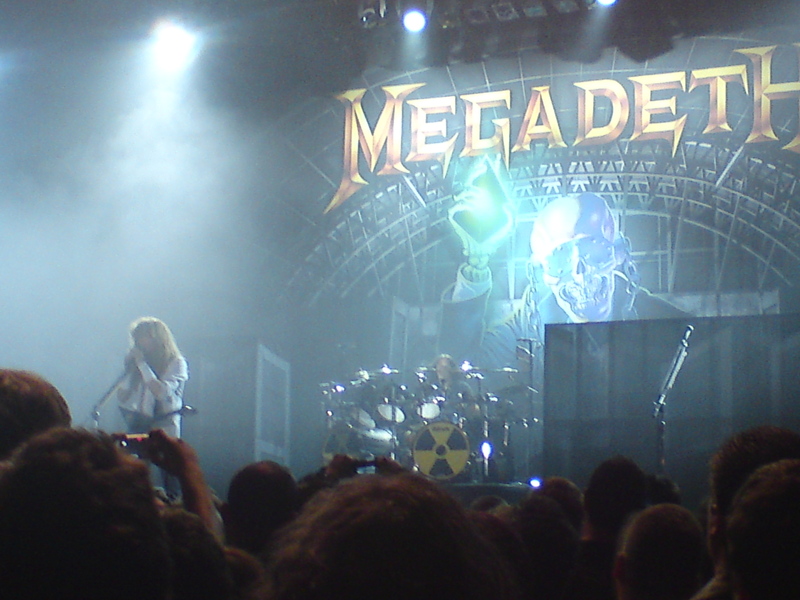 Even now, nearly thirty years after they formed, Megadeth can write and perform aggressive, angry metal like no-one else. Their latest album Endgame is a record that’s power is sure to grow with time but tonight, Megadeth are willing to forgo promotion in favor of treating their Irish fans to an overwhelmingly impressive array of their classics. Opening act Sirocco are onstage by the time Tickets There reaches the venue. After coming across them before during the MySpace Review series, we actually made an effort to catch their show and we’re glad we did. Not only have they got the songs to justify supporting the mighty Megadeth, they also have the performance ability to pull it off. Unfortunately the crowd tonight aren’t exactly swarming but Sirocco manage to entice those present to wedge around the front of the stage for a great set of Irish brand metal. Memorable and a perfect opener for the American metal heavyweights. 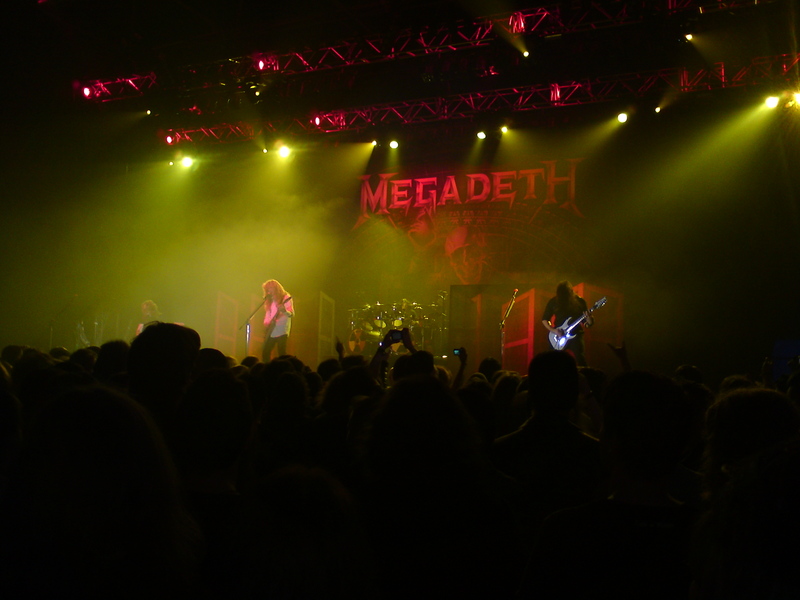 The lights go dim, air-raid sirens rev up and Megadeth arrive on stage one by one with Mustaine the last to appear. The show explodes open with a blistering version of Dialectic Chaos from Endgame and the sher force, might and power of their newer material is instantly conveyed to the crowd before the band lead into Wake Up Dead from their classic Peace Sells Album. Dave Mustaine’s vocals come out a little muffled during Wake Up Dead but seconds into the bands new single, Headcrusher, he comes to life, giving the song a power no producer can capture. 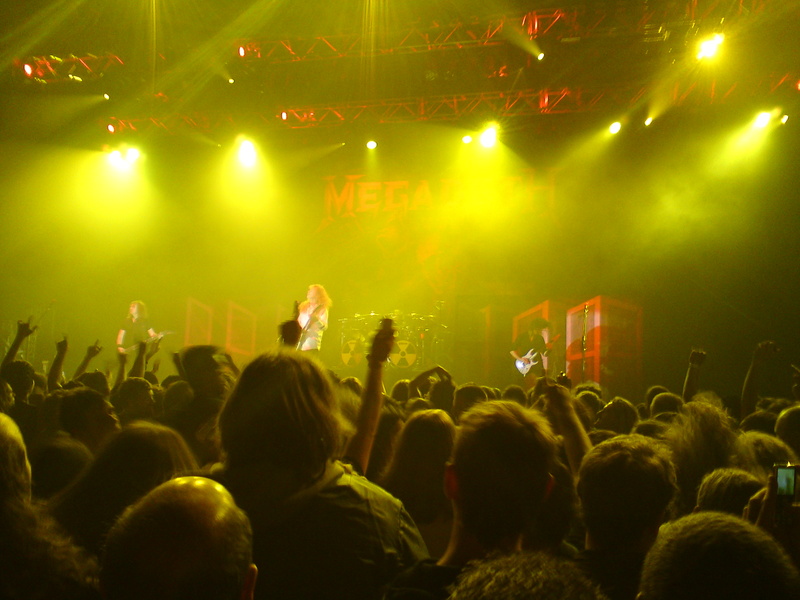 Rather than going the Iron Maiden route of forcing fans to sit through an hour of new material, Megadeth dip into their back catalogue and show the brutal force of In My Darkest Hour before delighting the crowd with a full performance of 1990’s Rust In Peace album to celebrate the records 20th anniversary. Holy Wars starts with a beefed up sound that sees band and fans alike put heads down and prepare for the war to come. The force of the performance is memorizing and grows stronger with each song. Hanger 18 enhances the feeling as Mustaine and Chris Broderick plough through the song’s four hundred and eighty six solos. Take No Prisoners and Five Magics are a thrill to finally hear live together before the face belting (not melting) Lucretia unveils its many layers of destructive powers. Tornado of Souls quickly becomes one of the nights highlights with the band’s unrelenting power showing no sings of surrendering. The opening notes of Trust signal the end of an amazing performance of RIP that many fans would have been happy enough to pay for on it’s own before the realization that The Deth ain’t finished yet. A Tout Le Monde brings the band to a higher level before an invasive performance of Sweating Bullets delivers some of the finest riffs n lyrics metal has to offer. The band closes the main set with a full on, no holes barred, grander the grand onslaught of Symphony of Destruction before returning to the stage for an extended performance of Peace Sells that annihilates all those left standing and trumpets the bands ascent to the thrones they so truly deserve. Mustaine might be generally thought off as the metal world’s trouble maker, but there’s no denying that his ability as a song writer, singer and performer makes him one of metal’s top caliber elites. After three decades his snarling mannerisms haven’t changed much but, neither has his power to deliver one of the finest metal shows you’re ever likely to see and tonight, the good people of Cork can attest to this. 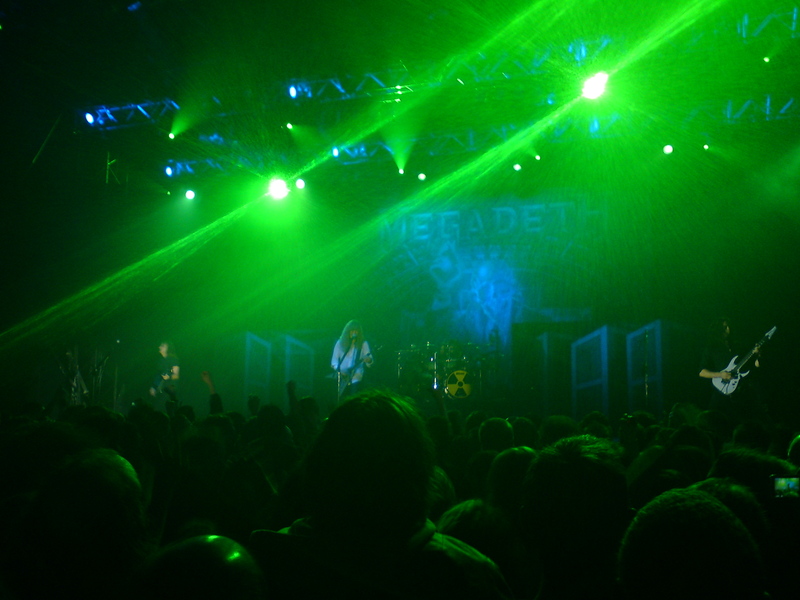 Hopefully it won’t be long before Megadeth return and do it all again. 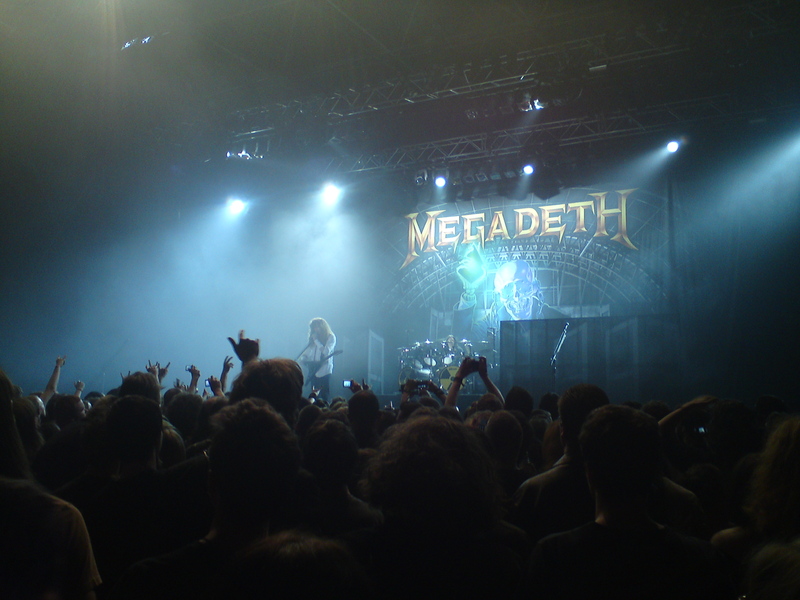 This entry was posted on July 4, 2010 at 6:04 am and is filed under Gig Review, Music with tags Chris Broderick, Dave Ellefson, Dave Mustaine, Megadeth, megadeth cork, Megadeth Cork Ireland, Megadeth cork pictures, Megadeth cork review, Megadeth live at the Marquee, Megadeth Live at the Marquee Cork. You can follow any responses to this entry through the RSS 2.0 feed. You can leave a response, or trackback from your own site.